Building a PC doesn't have to break the bank. For many enthusiasts, part of the fun of building a PC lies in not spending a penny more than necessary. Whether you’re building a basic everyday computer or trying to eke out a $500 gaming rig, shopping smart lets you do more with your money or, well, just plain save some cash on a purchase that’s already pricey enough. Good news: Costs savings abound, especially if you’re not in a rush. You just have to know where—and how—to look. These tips and tricks will help you save money on your next PC build. Measure twice, cut once. That timeless advice applies to PC building too. Think through every aspect of your build before picking up even a single component to ensure that you’re not buying too much, or too little, power for your needs—and that everything you buy works together. Planning is the most important part of building a PC. AMD's first graphics card built around its cutting-edge Polaris GPU delivers big performance and better power efficiency for just $200. Regularly updated component guides such as PCWorld’s own best graphics card roundup, Tom’s Hardware’s computer processor overview, and the Wirecutter’s SSD recommendations can help you identify the best parts for your particular workload, no matter what your budget is. Once you’ve identified the processor you need, you can choose a compatible motherboard with the connectivity features you need, and once you’ve identified a motherboard, you can choose what type of memory and storage to slot into it, and so forth. If you already have a computer, you can save a lot of money by reusing its parts inside your new PC. Reuse those case fans if you can! Building a new PC usually revolves around a new processor and motherboard, but there’s a decent chance you’ll be able to drag your older graphics card, storage, memory, or case over, especially if you’re replacing a PC that you purchased in the last decade or so. My personal rig packs some hard drives and case fans that have survived several builds at this point. Of course, be sure your old components are compatible with your new ones first. Older hard drives might rely on an interface that isn’t supported anymore, while many modern motherboards only support newer DDR4 memory—which means you can’t just slap in your existing DDR3 RAM. The free Belarc Advisor tool can scan your current system and let you know fine details about every component inside. Bonus: Belarc also reveals your software product keys to make migration to a new PC easy-peasy. Okay, so you know exactly what parts are going into your new PC. Exciting! Now it’s time to head to the aforementioned PCPartPicker, an absolutely invaluable resource for computer enthusiasts. 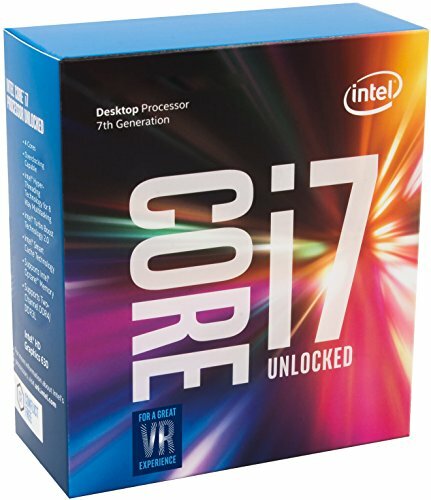 PCPartPicker’s listing for Intel’s high-end Core i7-7700K processor. PCPartPicker lets you virtually assemble your build piece-by-piece, down to every last component. If there are any system incompatibilities—such as the wrong motherboard, memory, or CPU cooler—the site will warn you about it. Extremely handy stuff. But it’s the money-saving aspects of PCPartPicker that earn it a spot in this guide. 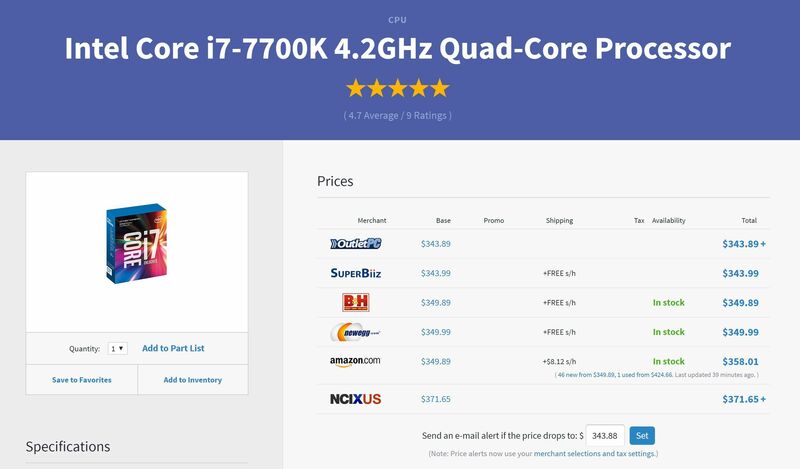 The site scours all the major electronics retailers in your corner of the web, so for each component in your build, you can drill down and see the best available price, along with shipping costs, applicable promo codes, and availability. (See the picture above of the Core i7-7700K listing.) What’s more, if you aren’t satisfied with the prices you see for a given piece of hardware, you can ask PCPartPicker to send you an email notification if the cost dips below a price of your choosing. How do you know if a PC component is priced competitively? PCPartPicker also offers tools that reveal recent price drops and show historical pricing trends for all sorts of hardware. Seriously, use PCPartPicker. It saves you real money, real fast. Many Newegg bundles are ho-hum, but there are definitely gems to be found, like the $48.95 savings on this AMD A6-5400K bundle. If you don’t have a physical retailer nearby, spend some time digging around Newegg for some of the key parts of your build. Newegg constantly offers bundles that group together several compatible components at a discounted total price. You can see them all here, or navigate to the page of one of the individual components on your list, where any available bundle offers should be on display. Even steeper savings can be had if you wait to buy all your components during Black Friday sales. If you chain together available bundle deals, discounts, and mail-in rebates, you can save quite a bit of cash: In 2016, you could build a gaming PC for as low as $350—including Windows. Even upgrading to a 1080p gaming rig came in at under $475, with further deals available for higher-end components. Did you notice the subtle subtext running through the last few tips? It’s this: If you don’t need a new PC right now, there’s no rush to buy your PC’s parts after you’ve planned out your build. Waiting gives your target hardware an opportunity to drop in price, and gives you more time to hunt around for better deals at various storefronts. Patience is a virtue. Just don’t wait so long that the warranty expires on the parts you’re slowly stockpiling. If a component’s dead on arrival, you want to know before the window to return it closes. Unless you’re lucky enough to be shopping right when a fresh generation of gear hits the streets and retailers are trying to clear stock, buying last-gen PC hardware won’t save you much money. If you really need to save some scratch, you could potentially save big money buying used parts. You have to be careful, though, since used hardware doesn’t come with warranties and there’s always the chance a part was ridden hard before it wound up in your hands. Though it's a TLC NAND-based drive, Crucial has endowed this 750GB SSD with enough cache (30GB) to cover nearly all common write operations, not just smaller daily ones. It's relatively inexpensive as well. As a general rule of thumb, processors, memory, and cases can usually be bought used without much concern, since they don’t have moving parts. (Ask if the processor was overclocked at a high voltage before buying, though, and avoid it if so.) Graphics cards are iffier but they can be okay if you can confirm that it’s working, is not caked with dust, and hasn’t been running at a high overclock for an extended time. Opinions vary about used motherboards, but since they’re the core of your PC and have lots of parts that can fail, I avoid them. Also avoid buying used storage drives, as they have finite lifespans and in the case of hard drives, moving parts. I’m also leery of picking up a used power supply, as it’s both an important backbone of your system and has moving parts. “Air” CPU coolers with heat sinks and fans typically should be fine, but avoid used closed-loop liquid coolers as those wear out eventually. 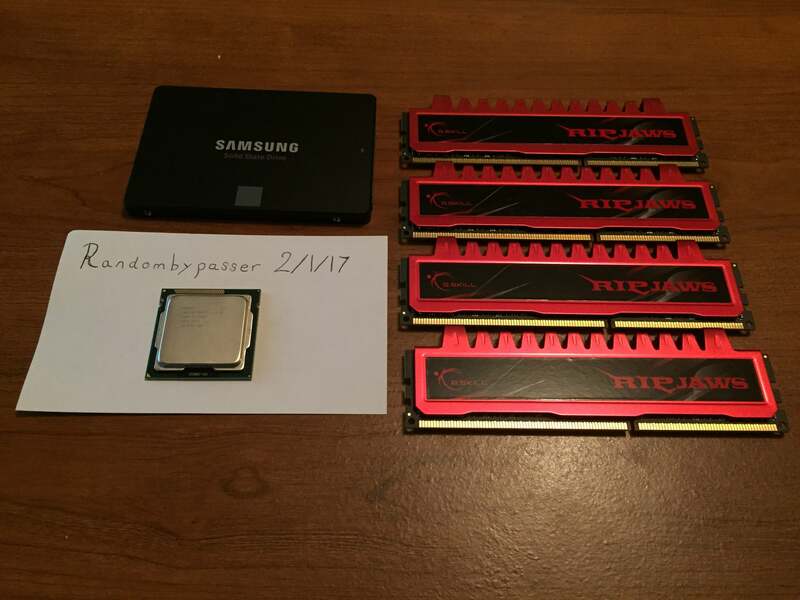 The r/hardwareswap subreddit relies on “timestamp” images that show the used PC hardware in your possession, and in working order. It’s best if you can see used PC hardware working before you buy it, which means that local sales and Craigslist are ideal. If you need to buy used PC parts online, the r/hardwareswap subreddit is a hotbed of activity. You can sometimes find good deals on Amazon and eBay, too, and those sites offer consumer protections that can often get you a refund if you’re sent a dud. Just do the math to make sure those shipping charges aren’t eating too deeply into the savings. And always, always check an online seller’s reputation before you shell out hundreds of dollars for a used part. Hardware isn’t the only cost when you’re building a new PC. Software can add up quickly—but it doesn’t have to. For a lot of people, the biggest software cost is Windows, at $100 or more. There are compelling reasons to try a no-cost Linux OS, but if you want to stick with Windows, you can often find people selling Windows licenses for under $30 on Kinguin, which is like an eBay for software. As for all the other must-have software that makes a PC actually useful, check out PCWorld’s guide to the 15 free programs your new PC needs. And that’s it! Hopefully these tips help you save some cash as you’re building a PC. If you need help actually putting all those parts together, we’ve got you covered. Check out PCWorld’s comprehensive guide to building a PC, a series of articles that covers every aspect of the process, from installing processors and case fans to avoiding common PC building mistakes. If this is your virgin foray into the wonderful world of PC building, be sure to read 7 things I learned once I built my first PC. And finally, once more before this ends: Use PCPartPicker. It really is great.